I took up clarinet at eight, was dumped in the school orchestra at twelve, endangered my degree by pretending to be a great saxophonist while at university and even played breadbox bass in a 'washboard orchestra' in Finland (we made the national press). 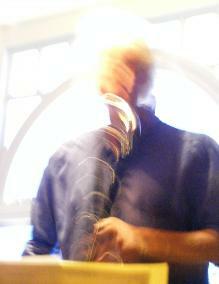 Nowadays I get more pleasure from the unruly and magical ways of free improvisation along with other members of Oxford Improvisers. Beam an improvising trio with Bruno Guastalla, Martin Hackett and Paul Medley. Ensemble Azut French Chanson with a number of twists featuring Bruno Guastalla, Dominic Lash, Paul Medley and David Stent. AMV. Led by Malcolm Atkins AMV is a quintet dedicated to the inauthentic performance of early music which has gone into temporary retirement.